One day, during the week before my mom passed away, we were all sitting at the table having dinner. At the end of the meal, a whole bunch of us got up to put dinner away. My mom was too weak and tired to help but she expressed that we were all doing so much and that she felt badly that she could not get up and join us. My brother responded with what I thought was the perfect answer. He said: “Mom, this just goes to show how many of us it takes to do what you have been doing alone your whole life”. So true. In the days leading up to my mom’s departure to heaven, it took so many of us to try to keep the house running semi-normally. As the days continued to pass, I could not help but think of my brother’s comment. It was so true and so fitting for the situation. Now that mom has passed away, I find myself thinking about this even more. I think about how despite her physical absence, we still benefit so much from all the work she has done for our home. It goes beyond saying that we have benefitted enormously from her raising us, but the little things have begun to stick out to me more in the last couple of days. I look at how she has lovingly decorated the house with pretty paintings and framed family pictures, how she has organized the medicine cabinet and how her kitchen is fully stocked with all the kitchen tools a family could ever need. It never occurred to me that even after her passing, we would continue to benefit from the household that she had put together and kept up for us. She perceives that her merchandise is profitable. 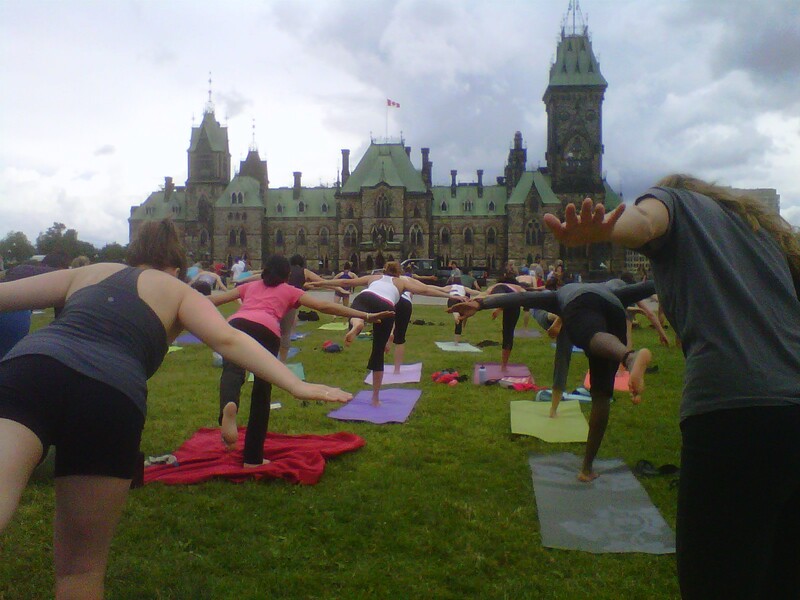 Yoga on the hill and some thoughts about freedom and rules..
One of my favourite activities from this summer has been Wednesday lunchtime yoga classes on Parliament Hill. This definitely needs to be added to the list of things that I will miss about Ottawa. Not only does it feel so awesome to be outside at lunchtime with a crowd of 500 odd people doing yoga on the grass (such a different feeling from a studio floor! ), but the idea of being right in front of our nation’s parliament is so inspiring. I love being there because I feel like I am a part of something great. I also love that while we are taking part in our yoga class, others are on Parliament hill with placards protesting whatever the cause of that day might be. I have traveled to parts of the world where you could get arrested for just taking a walk in front of the country’s house of government, and as a result I have come to appreciate the freedoms in Canada that others may take for granted. What I find most amazing though is that the very thing that allows our citizens to be so free is the very thing that restricts us: the rule of law. It is so interesting that, in the end, what creates order and freedom are rules. If you think about a country in which there are no rules or laws, you will quickly realize that what that country’s citizens have is the very opposite of freedom. This is a widely recognized principle in politics, and yet it seems that so many of us have such a hard time recognizing this idea in our personal lives. For instance, when I tell people that my faith is an important part of my life, I often get comments along the line of “that’s nice, but I don’t believe in following so many rules”. I find this ironic, because I believe that it is those very rules that have given me freedom in my personal life. In the same way that citizens of democratic and law abiding countries have been able to experience greater freedom than those under lawless regimes, the limits and boundaries created by the faith that I ascribe to are also what have allowed me to feel free. I think that so many of us are resistant to a deeper faith that requires some sort of commitment to rules because we don’t want to limit ourselves in this way. I would argue, however, that that the key to our liberation and emancipation as individuals might actually reside in allowing ourselves to be open to the boundaries and rules created by a higher order. How about you? Do you feel as though the rules and laws in your life have actually helped to liberate you in a strange sort of way?